One of the perks of being a cult artist is that you can count on a good portion of your audience to follow you anywhere. 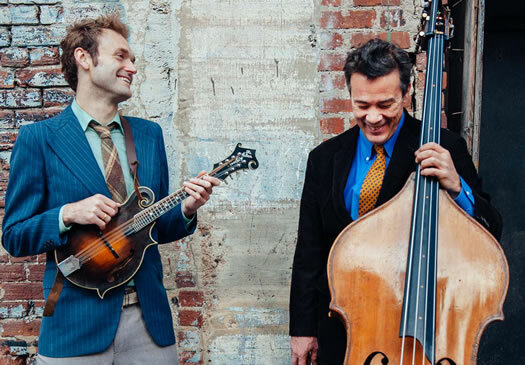 Barely a month ago, Chris Thile was onstage at the Uptown Theater celebrating the reunion of Nickel Creek, the influential bluegrass trio he helped found in the ’90s. A good portion of that night’s audience likely followed Thile across town for his Kauffman Center debut on Thursday night. Acclaimed classical bass player Edgar Meyer joined Thile onstage in Helzberg Hall. The hall was three-quarters full for the two-hour and 15-minute performance (including a 20-minute intermission.) Although the music occasionally recalled Nickel Creek’s buoyant acoustic melodies, Thile and Meyer quickly established their own identity. The pair play a hybrid of classical, bluegrass and folk, equally at home on the couch after dinner or dressed up at a wedding. The delicate bowed melody of “Monkey Actually” recalled banjo player Bela Fleck’s classical work. The connotation is appropriate, since both Meyer and Thile have worked with Fleck separately. Together, the pair earned a Grammy for their work with cellist Yo-Yo Ma. Much of the evening focused on Thile and Meyer’s new album, “Bass and Mandolin.” The pair played all but two tracks from their second collaboration. Standouts included “Friday,” which sounded like both instruments were in a race, and the gentle “I’ll Remember for You,” which found Meyer on piano and Thile on guitar. “It’s Dark in Here” could have been a lost Rodrigo y Gabriela cut. If albums like this had singles and radio had interest in playing anything like this, the enchanting “El Cinco Real” would be on every DJ and programmer’s desk in the country. Instead it will have to settle for a life of NPR bumper music. The material’s musical intricacies were offset by the pair’s between-song banter and jokes. One running gag was how lazy the song titles were. After fretting that the audience might not be able to keep up with the show not knowing that “Ham and Cheese” and “Fence Post in the Front Yard” had been played, Thile casually referred to two Bach arrangements as cover songs. After an improvised number the duo said since the piece changed every night, it should have a new title as well. They took several suggestions from the audience — “Swiss Cheese,” “Hole in My Sock,” “One Numb Toe,” “Succotash” — riffing on the ideas and sharing titles from other cities. In the end, Thile and Meyer decided they liked “Snuffleupagus” best. After announcing the upcoming intermission, Thile joked that they had been counting people during the first half of the set and would notice if anyone snuck out. Setlist: Why Only One?, The Farmer and the Duck, Monkey Actually, Ham and Cheese, Friday, FRB, Canon, I’ll Remember for You, Fence Post in the Front Yard. Intermission. Tuesday, Tarnation, This is the Pig, Look What I Found, El Cinco Real, Snuffleupagus, Prelude, It’s Dark in Here. Encore: BM3.